When stocks crash, everyone turns to CNBC, Fox Business et al to watch the carnage and the commentary. 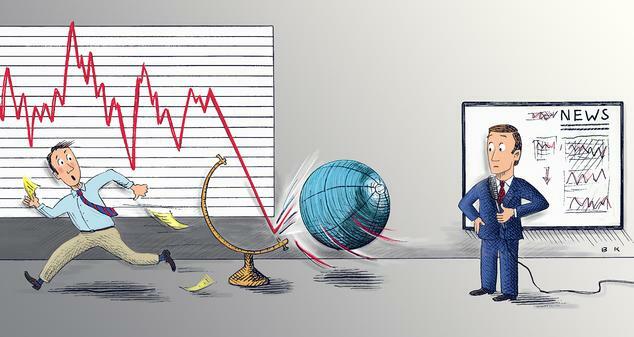 Here’s my advice as an anchor with a front-row seat for the last market crash: Don’t Panic. When stocks plunge, talking heads join the panic. Here’s how to keep calm while watching. Stocks may bounce back after last week’s losses, but eventually the bottom will drop out. When this long bull run finally ends, it may do so with startling force and volatility—stoked by automated trading, unflinching “sell” algorithms, and a dearth of buyers bold enough to try catching a falling knife. All this will unleash a spiral of demoralization on cable television and beyond. A parade of pundits—respected market-watchers, wealth advisers, former traders, journalists—will go on the air and evince an almost unanimous, unremitting despair. They will issue dark declarations and ominous warnings that could become self-fulfilling. I say this because I had a front-row seat during the 2007-08 financial crisis. As an anchor on CNBC, I felt the unalloyed fear and panic firsthand. 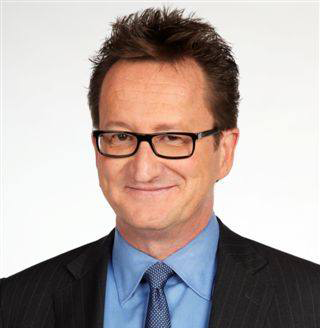 After 16 years at The Wall Street Journal and nine as managing editor of Forbes, I had joined CNBC in October 2007. The Dow was at an all-time high of 14000. Real estate was positively bubbly. Only a half-year later, Bear Stearns needed a weekend bailout and buyout. Lehman Brothers soon failed. Goldman Sachs and GE Capital were wobbly in their wake. A world-wide credit meltdown was possible, as was a global depression. Watching the crisis spread, 10 hours a day from the CNBC studios, was one the most intense experiences of my career. On set, we discussed dire proclamations: It was over for the U.S. economy amid a “new normal” of weak growth. Stocks and “buy and hold” strategies were dead. Wall Street never would return to the lofty profits of old, and Goldman Sachs would be neutered. The Fed’s desperate rescue measures could unleash devastating inflation. Or deflation. Or stagnation. Maybe even stagflation. Wherever there was a worry to be found, a talking head was happy to discuss it. Optimists looking for the upside, my preferred role, were scorned and ridiculed. One night on the CNBC show I briefly anchored, an acid-tongued market-watcher said he couldn’t name a single stock worth buying. Everyone thought he was right, and the clip went viral. In time they settled into an unrelenting pessimism, but a lot of the Eeyore-speak turned out to be unwarranted. Who knows how much it might have held back the rebound? Capitalism is optimism monetized. Markets are propelled by greed, yes, but also by hope. The next time stocks crash and the financial world tilts off its axis, the long-term investor should stop listening to cable news for a moment and keep a few points in mind. • When stocks plummet, TV’s bias is toward timidity. Financial advisers rarely get in trouble when their clients miss out on an upside opportunity. They can get fired for recommending a stock that loses money. What you hear on cable may be the fearful, knee-jerk wisdom of pusillanimous fraidycats. • On-air talent’s greatest fear is being wrong. It is safer to sound a warning than a reassurance. Almost a decade has passed since the last crash, and some on-air people never have covered a scary tumble. Others still lack a deep understanding of the markets. “We’re afraid we may not know, for sure,” as one Fox anchor told me a few years ago. • For on-air guests, it becomes a game of Can You Top This? When stocks keep falling, the temptation for commentators is to outdo one another in darkness and doom. • Advisers want to recommend action, and holding doesn’t qualify. In a crash, that usually means selling, even though stocks historically can be expected to return to their previous levels and rise again if you can wait long enough. • After the crash, the media will anoint a Nostradamus. This is someone who, with uncanny clarity, foresaw what everyone else missed. Few outlets will bother to check whether this genius was making the same prediction—wrongly—for a decade or longer before. The people I worked with at CNBC, and later at Fox Business, were smart and devoted. But when a crisis descends live on cable, it’s hard not to get caught up in it. Note to viewers: Don’t let the pessimists get you down. Mr. Kneale is a writer in New York.